We are excited to announce that we will be carrying La Cornue. La Cornue is a French oven and cooking range manufacturer founded in 1908 by Albert Dupuy. When Dupuy started La Cornue he wanted to create an oven using natural gas. By taking advantage of the circulation of hot air, he was able to create a much more effective oven. 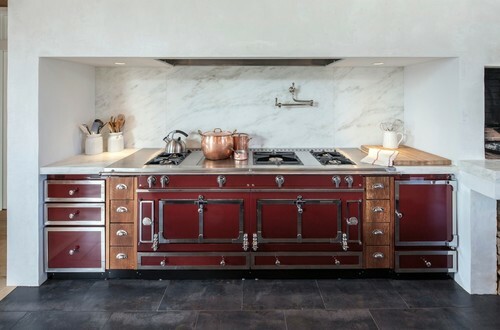 Their ovens also feature a concaved interior which allows for the oven to naturally convect. This results in super even heat distribution and ultimately better cooking results. La Cornue still handcrafts their ranges over 100 years later. They currently produce three ranges of ovens: Château, CornueFe and CornueFe 1908 ovens. Château ranges are built to order and made directly in France. Each unit is individually hand-made and customized based on the customers’ requests and specifications including heights and colors. They will also offer with several color options, trim options and several top cooking configurations. There is even a project manager dedicated to each range. This person follows production to the end until every last detail is finalized and meets La Cornue’s and your expectation. On the Chateau Series Ranges, even the cooktop configuration is customizable. There are several options to choose from. 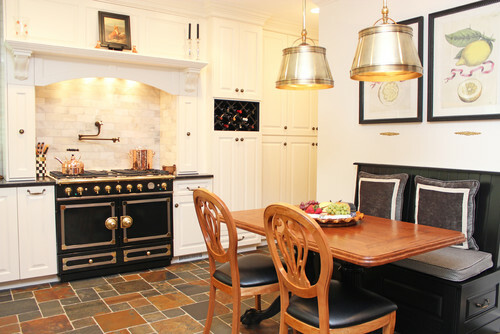 Two Gas Burners: Two Brass Burners set inside an enameled drip tray and topped with enamel coated cast iron grate. One 17,000 BTU & One 7,500 BTU Burner. 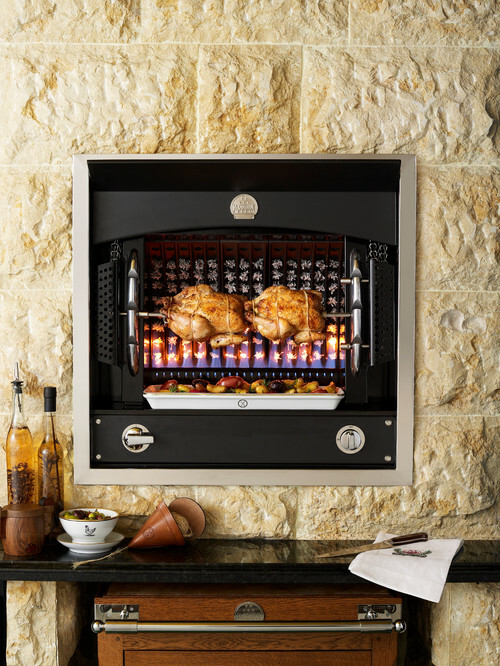 Lava-Rock Grill: Linear gas burner running front to back set beneath a bed of natural lava rocks and topped with an enamel coated open style grill; considered 14,500 BTU. Power Burner: One oversized brass burner set inside an enameled drip tray with an enamel coated cast iron grate. Great for sautéing or stir fry cooking. 22,000 BTU Burner. Plaque “French Top”: One gas burner installed beneath a solid cast iron top, serving as the heat source for the entire cast iron surface. The cast iron plaque becomes the cooking center and offers variable heat zones with the strongest heat in the center, directly above the burner, and diffuses outwards. This allows for multiple sauce pans above a single indirect heat source. Available in Large, Petite & Black Enameled. Two Electric Burners: Two solid cast iron electric burners set inside a stainless steel surrounding. Ideal for controlled heat and more delicate dishes, like eggs or crepes; 2,000 watts each. In 2005 the CornueFe Series was created. For those who hate to wait, these units are inventoried in California and are available in eight colors with three trim combinations. These are designed with the American kitchen in mind. These ovens are considered dual fuel, featuring robust brass gas burners on top and an electric multi function convection oven. In 2012 their newest series the CornuFe 1908 Series was created to meet the demands of the American market place. This oven is pre-built and also shipped from California. These ovens still feature their signature vaulted natural convection gas ovens, but in more standardized size and configuration options. This series is available in eight colors and three trims. La Cornue will also offer a variety of accessories to compliment their line of ranges, as well as a line of custom hoods and custom cabinetry. 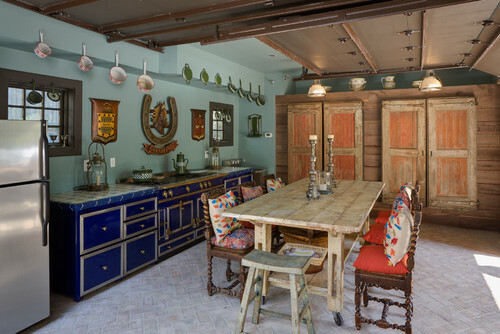 All of their cabinetry is open framed, and the countertops are not included. All drawers are standard with standard rubber drawer liners. They will also offer wicker baskets for some models, as well as false drawers that can be made into working drawers for an additional cost. 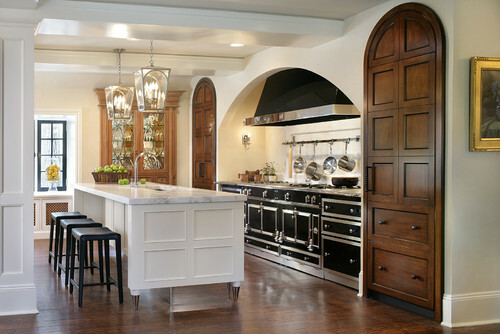 All cabinetry, hoods and Chateau lines are custom and have a wide variety of options. The ordering lead time for these is about 14 weeks. Another really neat appliance they offer is the Flamberge Rotisserie. This is a wall mounted gas rotisserie designed for residential use. It’s a show stopper! This unit is constructed with a concave rear wall of solid cast iron, and is heated by a powerful gas burner set beneath three motorized spits. Synthetic wicks pull the heat up through the vaulted back of the unit allowing the radiant heat to gently cook foods as they rotate slowly on the spit over the flame. This unit is also available in several color options to tie in all La Cornue pieces together. I love Wolf, Thermador, Miele, Jenn-Air and Gaggenau, but La Cornue is really different. The ability to customize everything from the color and accents, to the top itself truly separates La Cornue and your kitchen from all others. Is Color Replacing Stainless Steel? Get our free Pro Cooking Buying Guide with tips, trends and reviews of all the major brands. Over 80,000 people have already found answers in a Yale guide.